Today is the first day of school in Memphis, Tennessee. That means that I have larger blocks of time for my creative work which includes designing, weaving, and writing. Yes, this blog has suffered over the course of the summer, but today I will catch you up on the progress of the commission I was weaving for the synagogue. I was commissioned to weave two sets of four prayer shawls or tallitot in a particular style for the three rabbis and cantor who lead the congregation’s services. The first set will be unveiled at the High Holiday Services which begin at sunset the evening of Rosh Hashanah on September 8. This set of four prayer shawls is nearing completion. 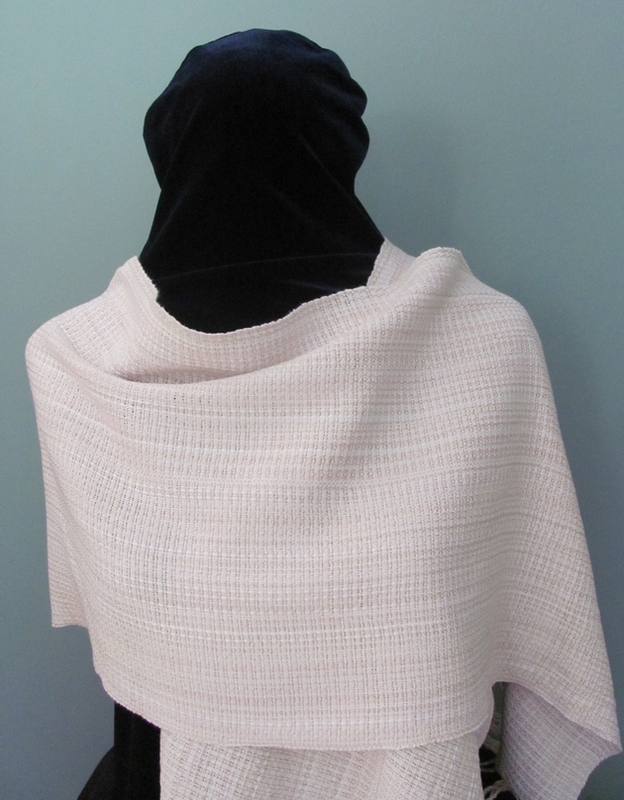 My friend and seamstress extraordinaire has sewn together the two panels of each prayer shawl, sewn on the neckbands, or atarot, and lined each one with exquisite Bemberg rayon. 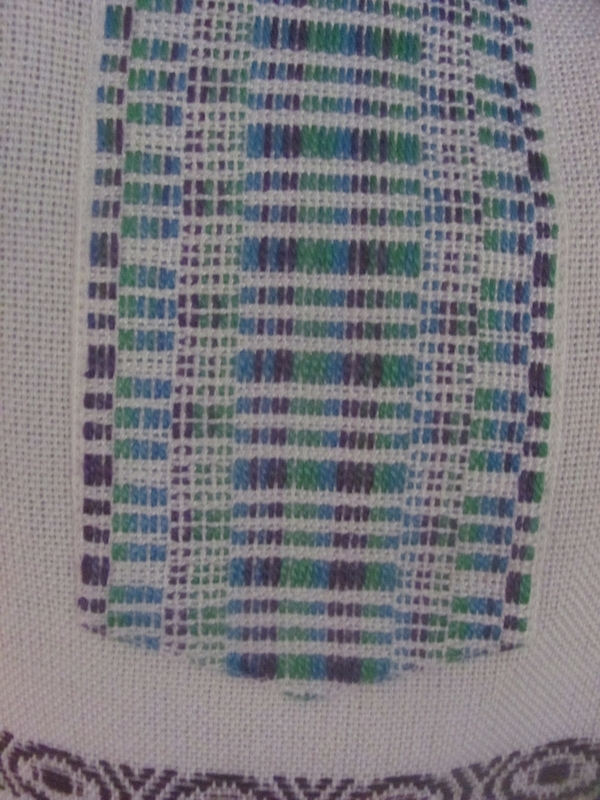 I still need to hand sew four small buttonholes at each of the four corners. These will be for the placement of the four tzitzit, or ritual fringe that will be knotted and wound according to the instructions cited in Numbers 15:37-40. The Torah is a scroll hand written in Hebrew and contains the Five Books of Moses: Genesis, Exodus, Leviticus, Numbers and Deuteronomy. Those leading a service of Jewish worship read from the Torah. In a synagogue, the Torah scrolls are housed in an alcove or cabinet referred to as an Ark. Above the Ark hangs an eternal light called Ner Tamid. Since the woven design of this first set of prayer shawls resembled a flame, I have titled this set Ner Tamid. For the prayer shawls, I wove a separate neckband, or atarah. 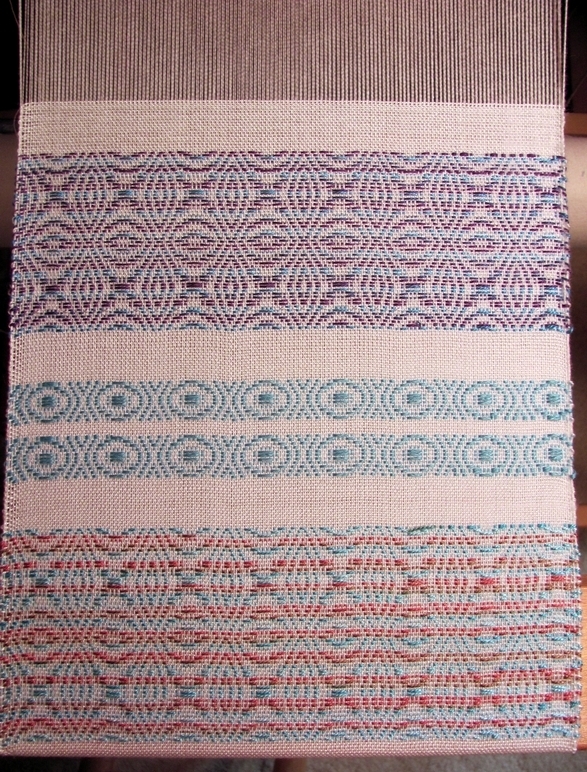 Atarot are not required of all tallitot, however they are customarily incorporated into the overall design of the prayer shawl and can be woven directly onto the body of the prayer shawl or woven separately and then sewn on in the final construction as in the case of the set I wove for this commission. The atarah above was woven with natural and hand dyed tencel yarn in a combination twill weave. Currently on my Macomber loom is the second set of four prayer shawls which will be finished shortly after the High Holidays in mid-September. So in the next month, I will need to finish weaving the body of the tallitot and also weave a separate set of four atarot. The second set of prayer shawls will be those worn for every day use, and the tallitot called Ner Tamid will be worn for special occasions such as holidays, weddings and Bar/Bat Mitvahs. Above is the design I am weaving for the second set of prayer shawls. They are also woven in natural tencel and bamboo yarn. As with the first set I am weaving two panels for each prayer shawls, and these have been threaded side by side on the loom and woven simultaneously so that the woven color bands will be of equal size. 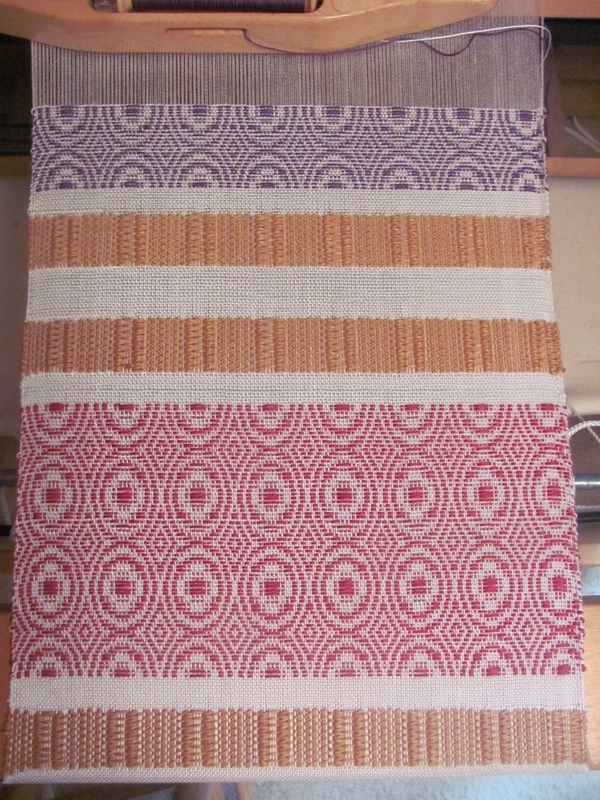 I haven’t named this set yet, but I’m sure that something will reveal itself to me during the weaving process. As the days grow shorter at the beginning of this school year, I will expect longer and uninterrupted blocks of time so that I can finally finish this project. It has been a rewarding journey, and I am really looking forward to seeing the rabbis and cantor wearing the new tallitot at the beginning of the Jewish New Year 5771. Tallitot is plural for tallit. For those of you who are wondering what a tallit is — it is a prayer shawl worn for Jewish worship. The shawl has special twined and knotted fringes called tzitzit attached to its four corners. There are more than two tallitot involved here, but I really liked the alliterative reference! This previous post described one of my long term projects – a commission to weave eight ceremonial tallitot, prayer shawls for a large synagogue. The project is currently on my loom and looks like this. This is the first prayer shawl in a series of four. These are ceremonial tallitot and so are narrower than standard prayer shawls. They will be worn around the neck much like a scarf and with a seam in the back. The tallitot will be lined and taper to a width of about four inches at the seam at the back of the neck. Here is my sketch for one side of the tallit. 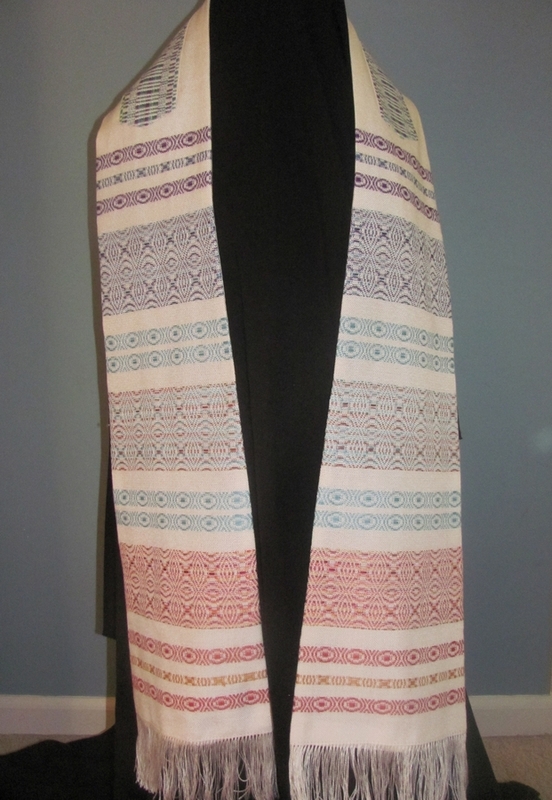 The reason that I am weaving a single tallit side by side is so that the pattern bands are equal in length as these will lie in front of the wearer and for the congregation to see. Ideally the pattern bands should line up with each other. This means that I am weaving with four shuttles at a time: each side has one shuttle for plain weave and one shuttle for the pattern weave. I will also be weaving a separate neck band or atarah which will be sewn over the back seam and whose design will extend onto the front of the prayer shawl. This is the blue green band that is at the top of the design sketch. 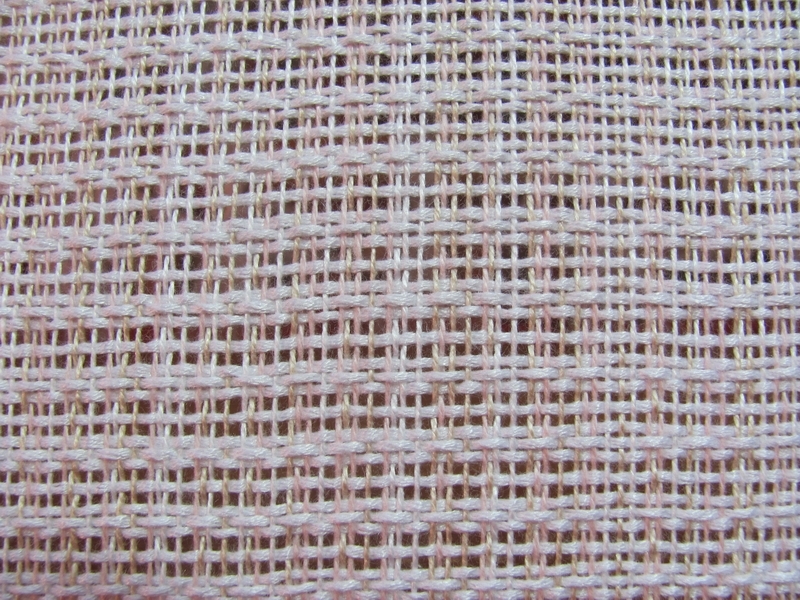 The warp and plain weave weft yarn for this project is an undyed natural 8/2 tencel yarn. 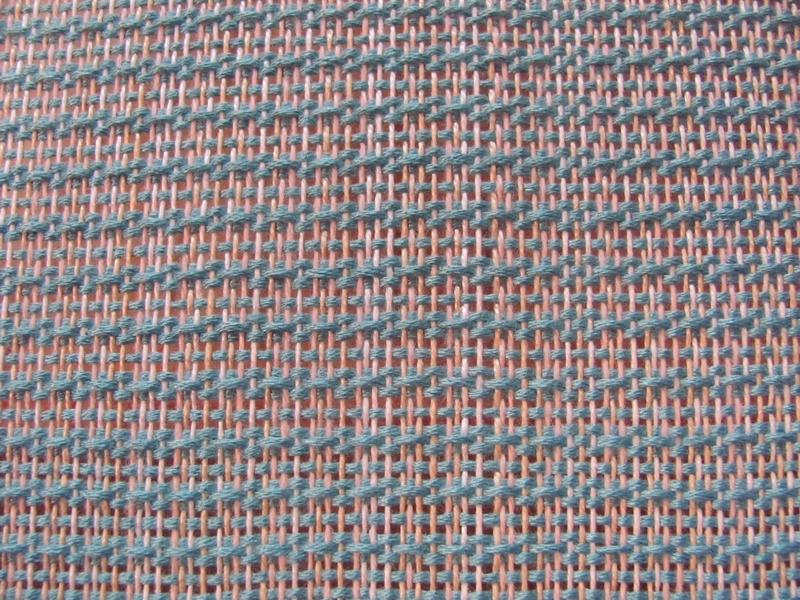 The pattern weft is Bambu 7 in solid colors and also a handpainted 5/2 tencel. 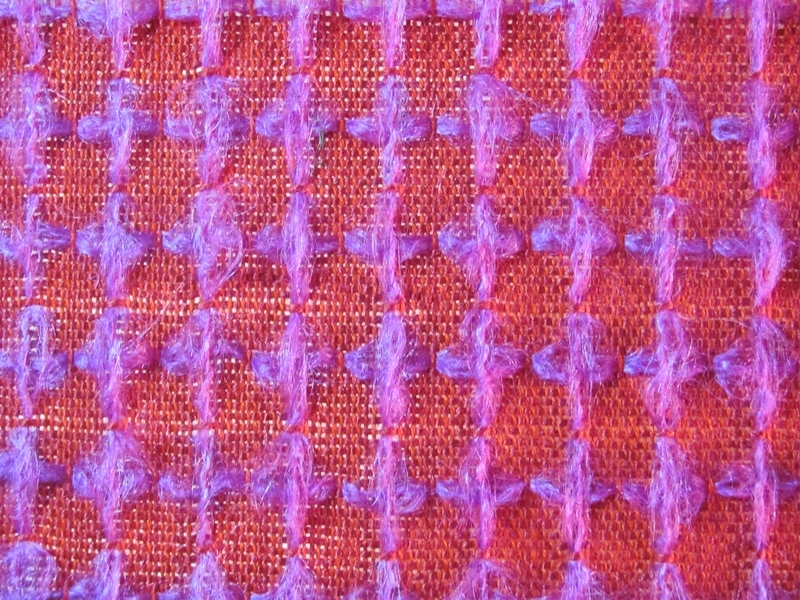 The pattern design is a variation of a honeysuckle twill. The weave pattern for the atarah will be in a different design. The imagery of the twill weave reminded me of a flame, and so this collection will be titled “Ner Tamid” the eternal light above the Holy Ark that houses the Torah and thus is a symbol of God’s ever presence. This first set of four prayer shawls should be completed by the time of the Jewish New Year, or the High Holy Days which this year occurs the first week of September. 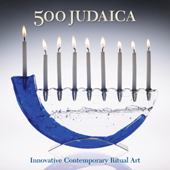 And at this time as well, Lark Books will introduce a new book: “500 Judaica: Innovative Contemporary Ritual Art.” This is one of Lark Books’ “500 series” of publications showcasing collections of contemporary design by an international array of artists in varying media. And it just so happens that four of my original design handwoven tallitot have been selected for publication in this book. This book will be available in September and can be purchased at all book stores and online shops. To find out more visit Lark Books. Much of my scarf inventory was diminished with the recent show less than a month ago. And with the weather warming up, tightly woven scarves were out of the question. 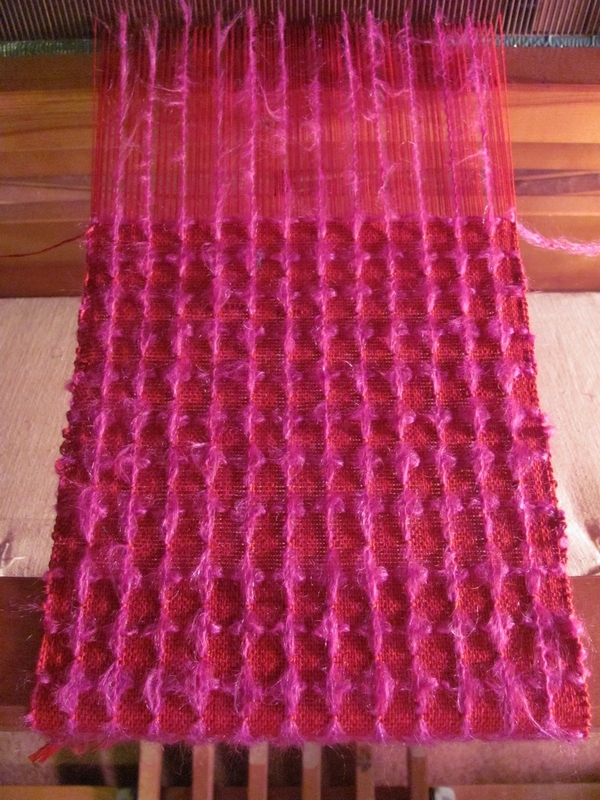 So I decided to weave some lacey scarves which really hadn’t been in my repertoire that much. After much research and deliberating, I settled on a weave pattern based on a modified Atwater-Bronson lace. The end product was a lightweight airy fabric that draped beautifully and was perfect for cool summer evenings, a rare occurrence here in Memphis. So this shawl really had to be pleasing to the eyes. The warp is a 10/2 perle cotton which was sett loosely at 20 ends per inch (epi). 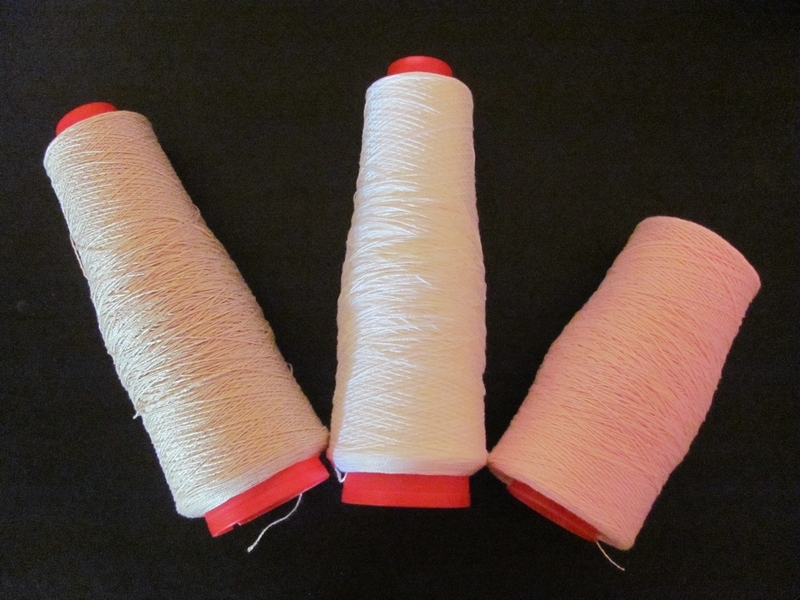 These three colors were used in the warp. I threaded a simplified variation of the more traditional 6 thread unit of the original Atwater-Bronson lace pattern. I used a 4 thread unit instead which utilized only 3 harnesses on my 8 harness loom. Sweet! Threading was easy. In a 10 dent reed, I threaded 2 ends per dent and in the heddles, threaded in this order: shaft 1, shaft 3, shaft 1 and shaft 2. This 1-3-1-2 threading was repeated for the entire 15″ width of the shawl. Treadling and tie up were even easier. I used only 4 treadles: treadle 1 raised shaft 1, treadle 2 raised shaft 2, treadle 3 raised shaft 1 and treadle 4 raised shafts 2 and 3 together. And so treadling was an easy to remember 1-2-3-4 ! The weft was 100% bamboo yarn, Bambu 7 from Silk City Fibers. Here is the detail of the lace weave with the Bambu 7 weft of “Rice”. Detail Atwater-Bronson Lace weave with Bambu 7 "Rice"
And here is a detail of the lace weave with a weft of the Bambu 7 yarn in the color “Tide Blue”. Detail Atwater-Bronson Lace weave with weft of Bambu 7 "Tide Blue"
So, was this simplified version of Atwater-Bronson lace weave a cheater’s lace? Definitely yes! And did it set me free? Absolutely yes! And Velma looked pretty good in the finished shawl. 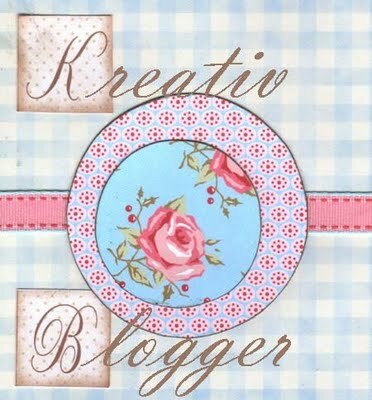 A couple of weeks ago Bety from Deep End of the Loom nominated me to be recognized as a “Kreativ Blogger”. 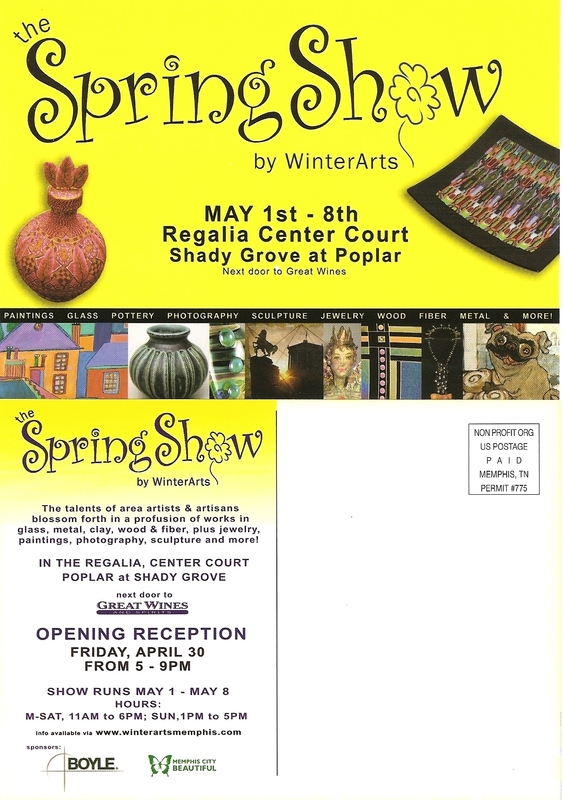 It was quite flattering and an honor to know that there are talented fiber artists out there who are reading my blog and may even be getting something out of it! I truly appreciate that! And I especially appreciate Bety’s acknowledgment of my efforts. 5. Nominate seven ‘Kreativ Bloggers’. Now for the seven things about me. Those of you who have been followers of my writings, rantings, and whatnot, know that I am a fanatic when it comes to music of all kinds. So in the “kreativ” spirit of this award, I am posting seven links to seven songs that I think will reveal a few things about me that most of you won’t already know. 1. “I Get Around” by the Beach Boys. It’s not what you think. I’ve lived in two countries and fourteen cities. I am a mama, and occasionally I complain. I’ve been told I’m paranoid. And being in Memphis, I had to include one by Elvis. Just listen to the lyrics…. Because I’ve been told I talk too much and what I say may or may not be about nothing. I also enjoy good food and good wine. Because life is too short…. That was the easy part. Now for the hard part. There are many, many more blogs that I would like to add to this list of seven. But as I am limited to only seven, here are my nominees in no particular order for “Kreativ Blogger”. Congratulations to all the nominees. May we continue to be honored by your words, photographs and creativity. I’ve always loved those lightweight gauzy scarves that many department stores carry. They look so elegant and swing softly with the wearer, making every movement look so graceful. Very chic. And they’re almost always imported from another country, sometimes India, sometimes Nepal or Thailand. Being a handweaver of scarves here in the States, I cannot bring myself to purchasing an imported scarf. So when I was asked to demonstrate weaving on a rigid heddle loom for a community event, I thought it would be a good idea to warp something on the loom that might capture the feeling of one of those flowing and colorful scarves. For the warp yarns, I decided to use two balls of Berroco’s Zen Colors. 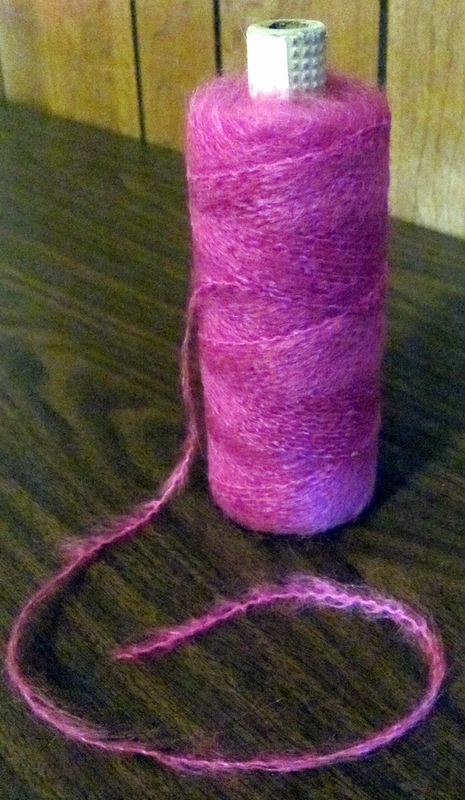 This is a cotton and nylon ribbon generally used by knitters. One ball was a bright multi colored variegated pattern of lime green, turquoise, orange and red. The other ball had stripes of pink and orange side by side. Also in the warp is a cotton/acrylic nylon yarn in light green spun with a multi-colored ribbon. This is Katia’s Sonrisa. The warp yarns were purchased online from Webs in Northampton, MA during one of their clearance sales. I threaded the warp yarns on a 24″ wide Schacht rigid heddle loom and with an 8 dent heddle. I have several of these looms that I use in my weaving classes. They are true workhorses. – built sturdily with indestructible wood. As I understand it, Schacht is no longer manufacturing these looms, but rather concentrating on their line of “Flip”, a folding rigid heddle loom, and the “Cricket”, both excellent looms, and more portable than the ones that I have. 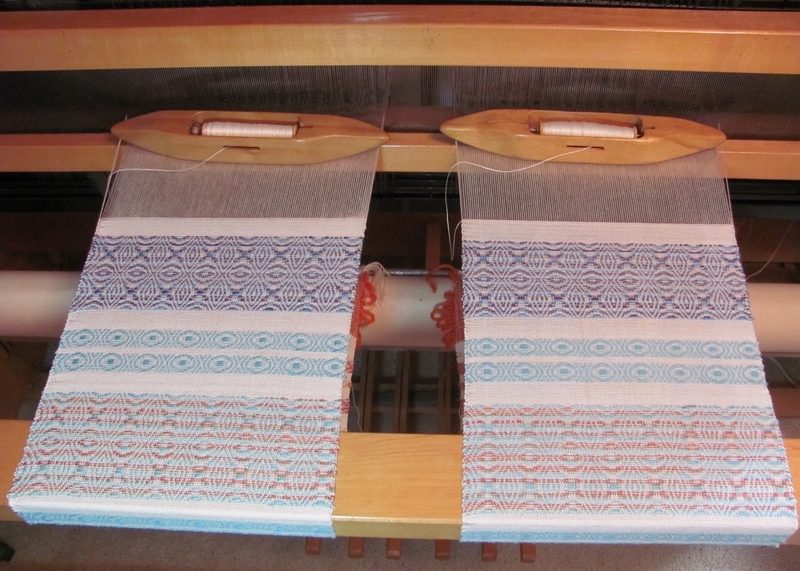 I warp my rigid heddle loom using the direct warping method. That is I do not use a warping board or reel to wind a warp chain first before threading the rigid heddle. I thread the warp yarns directly from the balls or cones to the slots of the rigid heddle. I believe that Rowena Hart was the first to describe the direct warping method in her book, The Ashford Book of Rigid Heddle Weaving published in 2002 and recently reprinted. While threading the slots in the rigid heddle, I started with the Sonrisa yarn and threaded every other slot, leaving the alternating slots empty for the time being. Once I finished threading with the Sonrisa for the width of the scarf which is 7 inches, I went back and threaded every other of the remaining empty slots with the pink/orange ribbon yarn, leaving the alternating empty slots blank for now. After the ribbon yarn was threaded across the width of the scarf, there were still empty spaces at every fourth slot. 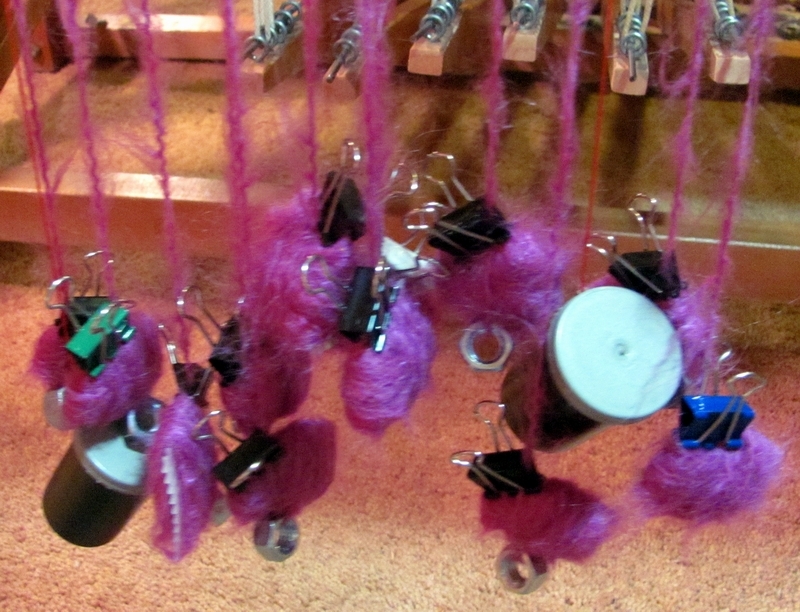 These slots were the last to be threaded with the multi colored ribbon yarn. Unconventional? You bet! But the results were worth it, and the time saved by not winding a warp chain beforehand is priceless! Now to get that lightweight, gauzy effect, I decided to use a fine cotton yarn, 10/2 perle cotton in the color Oleandar by UKI. This can be ordered directly from the manufacturer, www.ukisupreme.com. I really like the way some of the ribbons twisted slightly during the weaving process, adding a bit of texture to the fabric. The scarf looks a bit like gauze and it feels like a fine fabric. 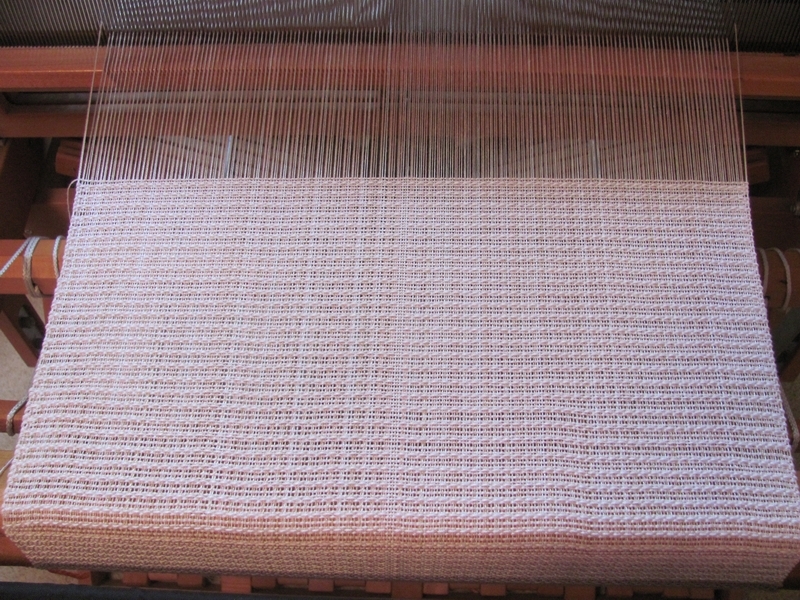 I hope it will flow gracefully once it is off the loom. I can’t wait to wear it!